The Lew Electric RRP-2-A-T is a recessed floor plate with aluminum cover. The back box is not included, use with an approved 2″ x 3″ box with a depth of 3.5″. Inside the floor box is an empty 4 port keystone plate. The sleeve in the box is adjustable up to 3/4″ to accommodate any floor making installation a snap, screws are included to attach the plate to the receptacle box. The box may be attached directly to the floor or routed 3/4″ into a finished floor. The box cover includes two screw plugs to gain access to your connections. The box features a watertight construction, there is also a durable 1/16″ neoprene rubber gasket that goes between the connections and plate. 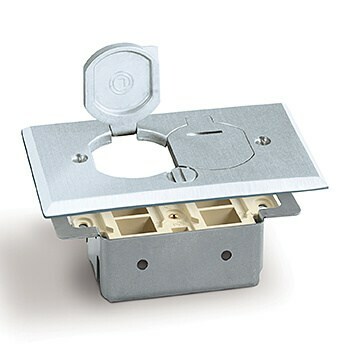 This floor box is a simple and economical solution to provide your own keystone jack connections in a small and attractive plate.